In light of this, the government currently provides direct assistance in meeting the security costs for Jewish schools. 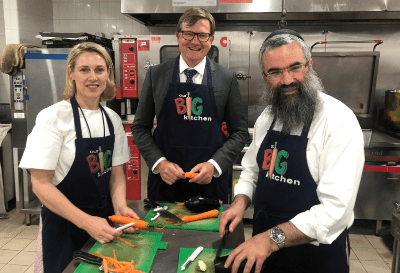 Recently this assistance was extended to a small number of other Jewish institutions including some synagogues, museums and community centres. However, the vast majority of non-school Jewish institutions which have applied for security funding assistance missed out. Unfortunately, Australia is not immune from the global rise of anti-Semitic attacks. It is deeply distressing that in modern-day Australia we need security guards outside Jewish schools, places of worship and other institutions. That is why I support increasing security funding for at-risk institutions. Furthermore, I will work with local and State authorities and the Jewish community and its security experts to ensure necessary security measures to protect Jewish institutions deemed to be at risk. I am in favour of increasing the support to all schools in the community; whether they are independent, Catholic or public. I support the right of all parents to educate their children at the school of their choice. My wife is an early childhood educator at a catholic school in the electorate and we currently send our children to a local Catholic school. I do not support the unilateral recognition of a State of Palestine. I would only support the creation of a Palestinian state as a part of a comprehensive two-state solution that ensured Israel’s right to exist and defend herself within safe and secure borders..
Jerusalem’s status must be determined as part of an overall two-state solution. Too often, the United Nations has become a platform for anti-Israel rhetoric, however, we have to remain involved in international forums to counter the extremists. We cannot vacate the space. Australia has been a consistent supporter of Israel and western democracies since the UN’s inception. Australia has to continue to provide a sensible moderate voice. As a middle power, we have a duty and responsibility to remain active in international forums. Iran is the greatest threat in the region – especially towards Israel. Most of the major players in the Arab world have also recognised and acknowledged the Iranian threat. The Iran nuclear deal was not perfect, but it was the only deal the international community had. What we need to avoid is a nuclear-armed and muscular Iran. We all fear what would mean for global and regional security – particularly for Israel. Furthermore, I would sign a declaration stating the international definition for antisemitism. I am comfortable with the marriage equality legislation passed last year and the protections it provides.